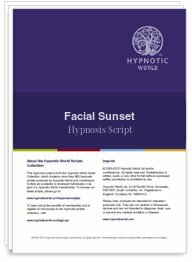 Prepare your clients for a successful hypnotherapy session with the use of this Facial Sunset hypnosis relaxation induction. As they begin to relax their facial muscles, your clients will be swept away by the tranquil sunset scene description in this visualization. And as their face begins to relax so will the body and mind - until they have achieved a comfortable state of relaxation from which to deepen the trance and supplement with a suitable therapeutic approach.